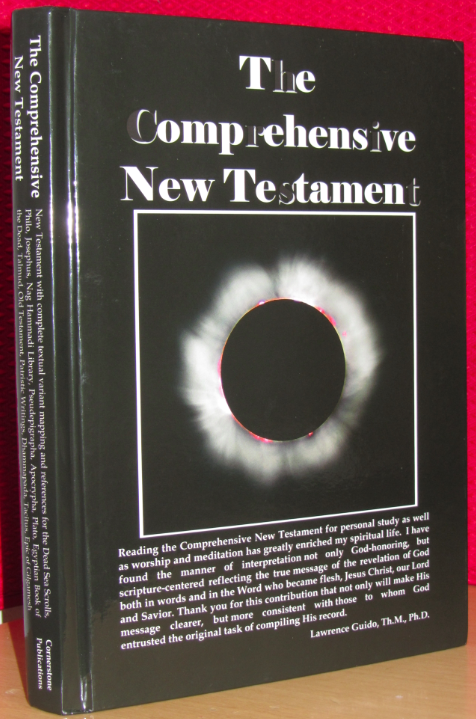 For sample verses from the translation by Timothy E. Clontz, click here. Comments: The translation can be downloaded in Microsoft Word and plain text; this is the Microsoft Word edition. 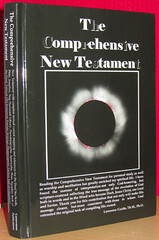 Contents: The New Testament in traditional order. – Praise (3 pp); Footnote key (2 pp); Preface (8 pp). – Cross Reference Index (295 pp); Topical Notes Index (5 pp); Bibliography (4 pp). Comments: Hardcover large octavo, adhesive binding, (12), X & 746 pp. Scripture text in single column, paragraph-wise. Textual sources, variants and their rendering in other English translations in copious footnotes. The editors wrote a lengthy Preface, dated April 7, 2008. 3.) Footnotes show the variants of the Alexandrian, the Byzantine, the Majority, the Peshitta, Vulgate and the Patriarchal textual group. 4.) 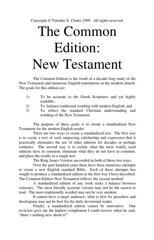 The Cross Reference Index points to passages in the Old– and New Testament, OT Apocrypha, Apostolic and Patriarchal Writings, Dead Sea Scrolls, Dhammapada, Epic of Gilgamesh, Golden Verses of Pythagoras, Greek Literature, Nag Hammadi Library, NT Apocrypha, Pseudepigraphica, Rabbinic Writings, Tacitus, The Egyptian Book of the Dead, Works of Josephus, Philo and Plato. 5.) 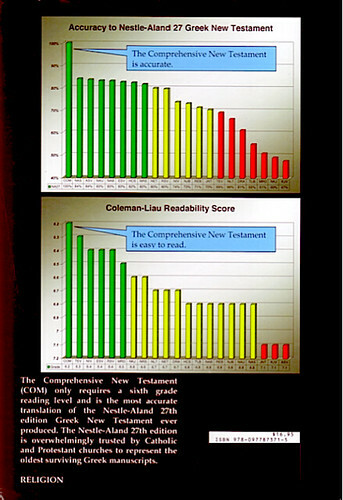 The Graphs depict the Accuracy index to the 27° N/A GNT and the Coleman–Liau Readability Score (see image of rear cover). 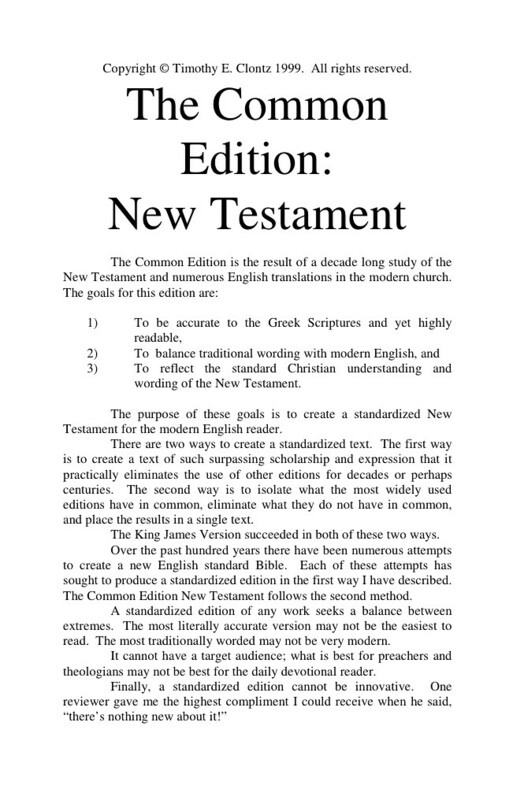 The readings of more than 20 English translations, from Bruce Metzger´s Textual Commentary on the GNT, the 1769 Blayney Revision of the 1611 KJV to the 2007 ESV, appear as examples in the above mentioned footnotes. The Cross Reference Index, starting with p. 439 (and running for 295! pp. 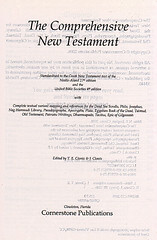 ), lists thousand of parallel and similar passages to the NT, more than 130 of which are cited.